PITTSBURGH, April 15, 2019 /PRNewswire/ -- Poor quality data poses the biggest challenge to successful anti-money laundering (AML) compliance screening. In a recent survey, 63% of compliance professionals reported lacking confidence in their data. 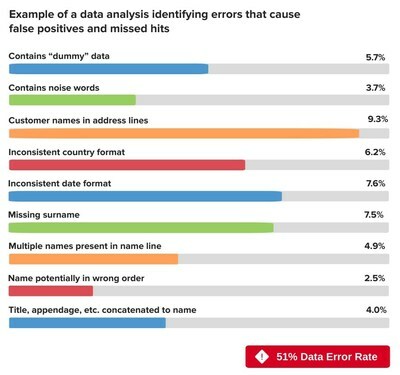 The irony is that compliance officers have no control over the quality of their data, yet are responsible for the consequences of bad data – namely, too many false positives, unnecessary due diligence, and the ultimate risk of missing a true hit, which can lead to huge fines and reputational damage.